We all need some fats (or more correctly, we need their fatty acids) as part of our normal diet. 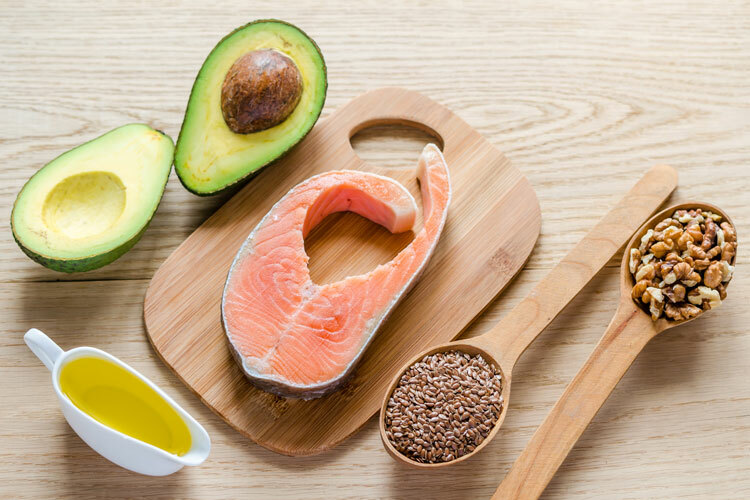 All fats deliver fat-soluble vitamins and provide kilojoules for fuel, and some unsaturated fatty acids are essential, contributing to the structure of the brain and are also vital for membranes around every body cell. However, not all fats are equal, and some types of saturated fatty acids play a role in heart disease and should be reduced in the diet. And trans fat, produced when vegetable oils are processed for use in crisp-textured foods and some frying fats, should be eliminated. Unsaturated fats are defined by their chemical structure. Those that are visible (as in oils and spreads) are liquid or soft at room temperature and can be classified as monounsaturated or polyunsaturated. Different types of unsaturated fatty acids may have different health benefits but unsaturated fats are generally healthier than saturated fats. Why are unsaturated fats good? When they replace saturated fats, unsaturated fats can help reduce blood cholesterol levels and thus lower the risk of heart disease. Extra virgin olive oil, with its monounsaturated fat plus its wide range of other protective factors, forms a staple of the Mediterranean diet, a healthy balanced diet that reduces the risk of heart disease and some cancers. Which foods contain unsaturated fats? Foods rarely contain just one type of fat and are usually classified according to the predominant type of fat present in the food. With visible fats, those that are mostly unsaturated fats are generally liquid or soft at room temperature. See the table below for foods which are rich in particular types of unsaturated fats. May help prevent arrhythmias (abnormal heart rhythm). Good sources of monounsaturated fats are olive oil, peanut oil, most nuts, avocados, canola oil and canola/olive oil spreads. Monounsaturated fats are also found in eggs and chicken. Polyunsaturated fats can be divided into 2 groups: omega-3s and omega-6 fats. Two polyunsaturated fatty acids are regarded as 'essential' because the body can't make them - they must come from food. The 2 essential fatty acids are alpha linolenic acid (an omega 3 fat) and linoleic acid (an omega 6 fat). Polyunsaturated fats are used as building blocks in the membranes that surround all the cells of your body and contribute to the structure of the brain. Omega 3 fats, especially those found in seafood, are vital to help control inflammatory reactions in the body. Omega-3 fats (known as EPA and DHA) are found in seafood, with smaller amounts of another omega 3 fat (known as DPA) present in the meat of grass-fed animals. Legumes (especially kidney and haricot beans and lentils), wild rice, tofu, canola and soybean oils, kangaroo meat, walnuts, flaxseeds (linseeds) and omega 3 eggs are sources of alpha linolenic acid (known as ALA). Fish and seafood are such good sources of omega-3 fats that the Australian Dietary Guidelines recommend including around two serves of fish a week (100g or a small can is a serve). All Australian fish and seafood are ‘good sources’ of omega 3 fatty acids, with sardines, mackerel, salmon, herring and trout (fresh or canned) especially good sources. However, some imported white estuary or freshwater fish have only low levels of omega 3 fatty acids. Commercial fish oil supplements contain omega 3 fatty acids in a concentrated form. The Heart Foundation states that it recommends fish rather than supplements, although it notes that fish oil supplements are not harmful. The upper limit of omega 3s for supplements is 3 g/day. They should be kept refrigerated as fish oils go rancid easily. Omega-6 fats are predominantly found in plant foods such as vegetable oils and spreads, and seeds. The balance between omega 6 and omega 3 fatty acids is also thought to be important, especially in controlling inflammatory reactions within the body, including in the arteries. In general, most Australians need more omega 3 fatty acids. Remember though, that in terms of kilojoules, all fats are the same, and even though unsaturated fats are healthier than saturated fat, they still contain the same number of kilojoules gram for gram. 1. Australian Government. National Health and Medical Research Council. Department of Health and Ageing. Australian Dietary Guidelines. 2013. Available at: http://www.eatforhealth.gov.au/ (accessed May 2015). 2. CDC. Polyunsaturated fats and monounsaturated fats. Last updated Sept 2012. http://www.cdc.gov/nutrition/everyone/basics/fat/unsaturatedfat.html (accessed May 2015). 3. Dietitians Association of Australia. Unsaturated fats. http://daa.asn.au/for-the-public/smart-eating-for-you/nutrition-a-z/unsaturated-fats/ (accessed May 2015). 4. Mayo Clinic. Dietary fats. Know which types to choose. Updated August 2014. http://www.mayoclinic.com/health/fat/NU00262 (accessed May 2015). 5. Heart Foundation. Eat fish for a healthy heart. April 2015. https://www.heartfoundation.org.au/news-media/Media-Releases-2015/Pages/eat-fish-healthy-heart.aspx (accessed May 2015). 6. Harvard Medical School Family Health Guide. The truth about fats: the good, the bad and the in-between. Feb 2015 update. http://www.health.harvard.edu/staying-healthy/the-truth-about-fats-bad-and-good (accessed May 2015). 7. Harvard School of Public Health. Omega-3 fatty acids: an essential contribution. http://www.hsph.harvard.edu/nutritionsource/omega-3-fats/ (accessed May 2015).